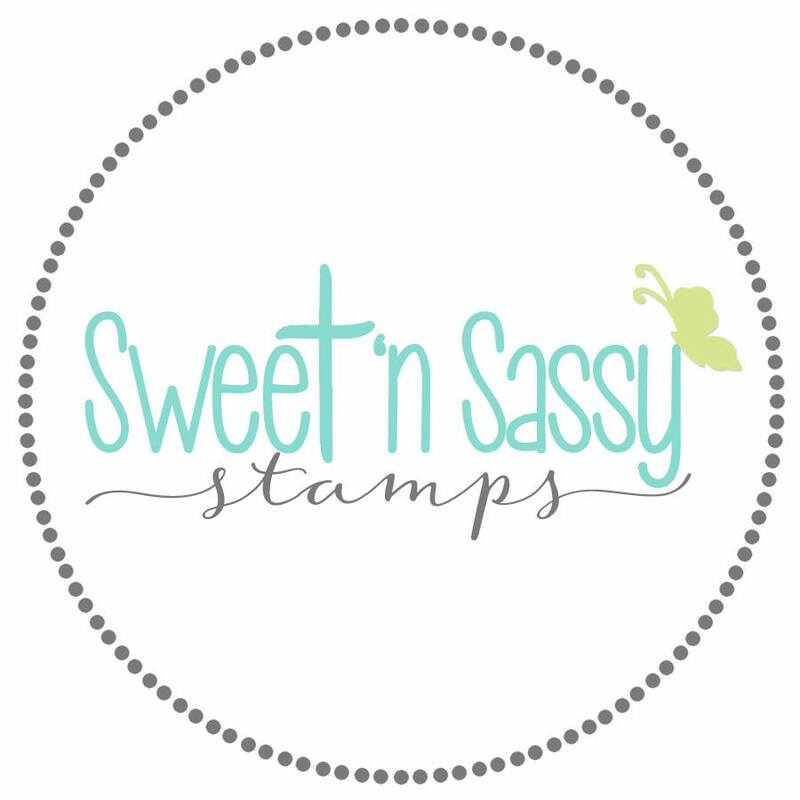 Be sure to check out all three of the new bundles being released today at the Sweet 'n Sassy Stamps Store. 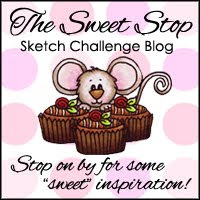 If you are not familiar with the Sweet Perks Club, just click the Logo below for all the details. Just remember when those changes blow your way, what God promises in Romans 8:28, "And we know that all things work together for good to those who love God, to those who are the called according to His purpose." There is one thing that never changes…God is the same yesterday, today, and forever! His love for you is for all eternity! Hello friends! Life truly is a gift and I thank the Lord for every day that He gives me to live it and for every undeserved blessing He bestows! 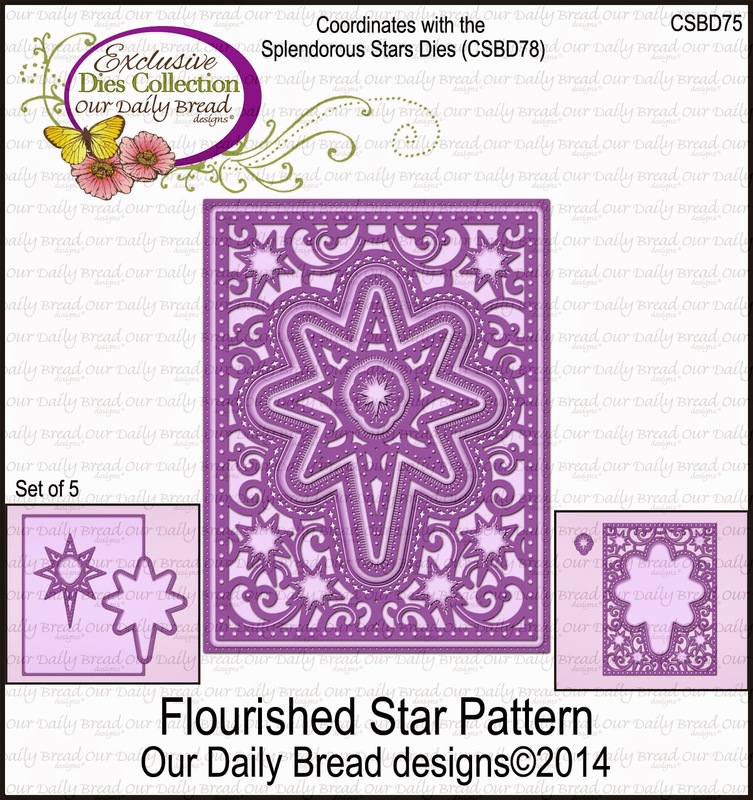 My card today is for Linda's Monochromatic Challenge on Splitcoaststampers and uses the MOJO Monday Sketch for this week and two new stamp sets released this month by Our Daily Bread Designs. 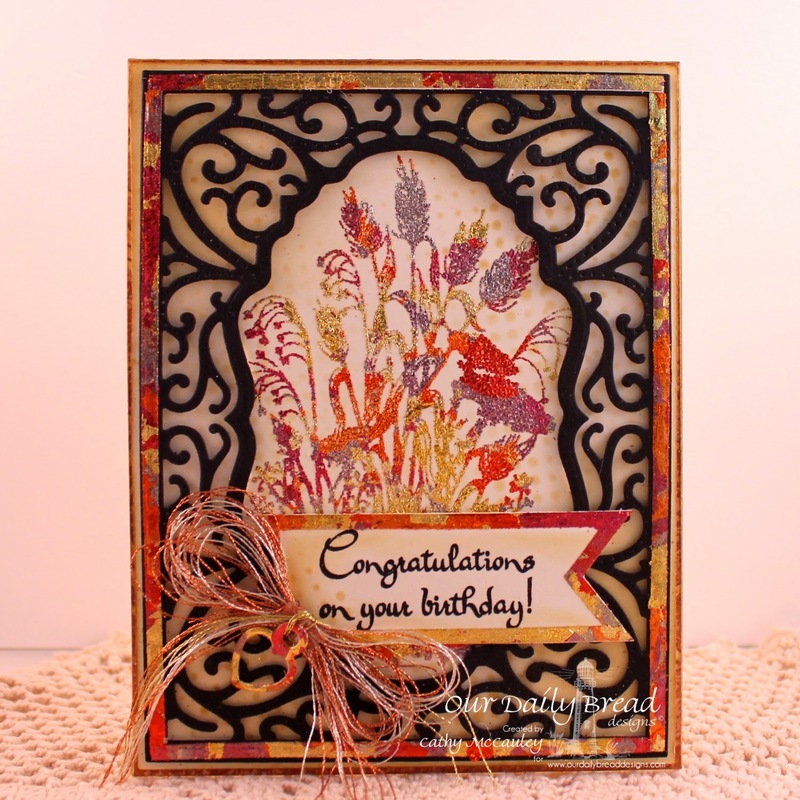 Creative Nugget: The card front was made by stamping the Wildflower Silhouette Background with Hello Honey ink, cutting the panel with the large frame die in the Flourished Star Pattern Die Set, and matting it with Smokey Shadow card stock. Vellum was embossed with the Faithful Fish Pattern Die and stitched across the middle of the card front. The main panel was stamped with the Life is a Gift image in Crushed Curry ink then offset and stamped again in Daffodil Delight. 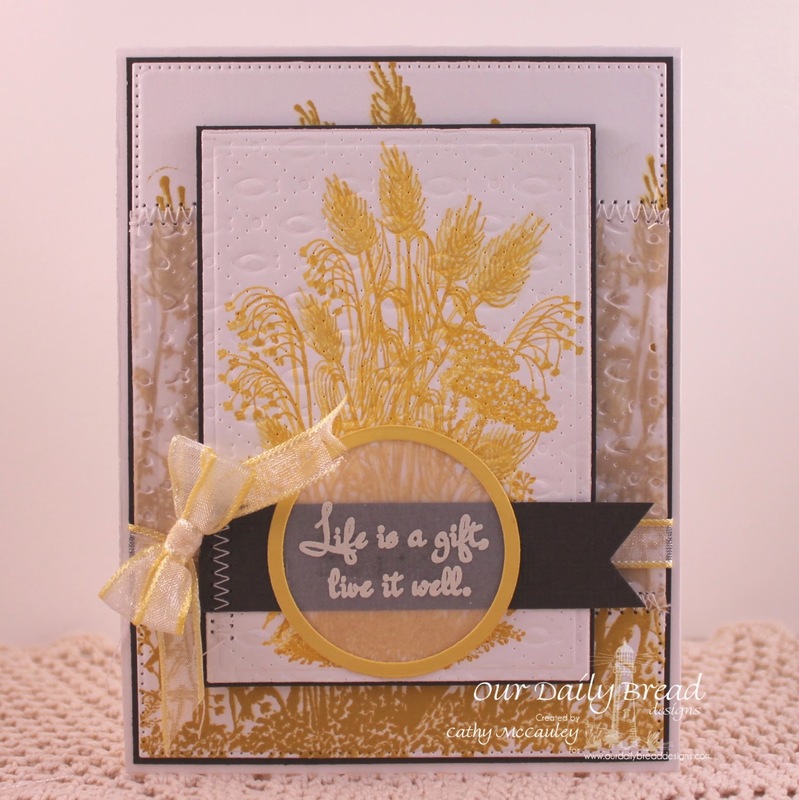 The wheat was brushed with clear Wink of Stella and white gel pen dots were added to the Queen Anne's Lace. This panel was also embossed with the Faithful Fish Pattern Die. The Smokey Shadow banner was stitched on the side. 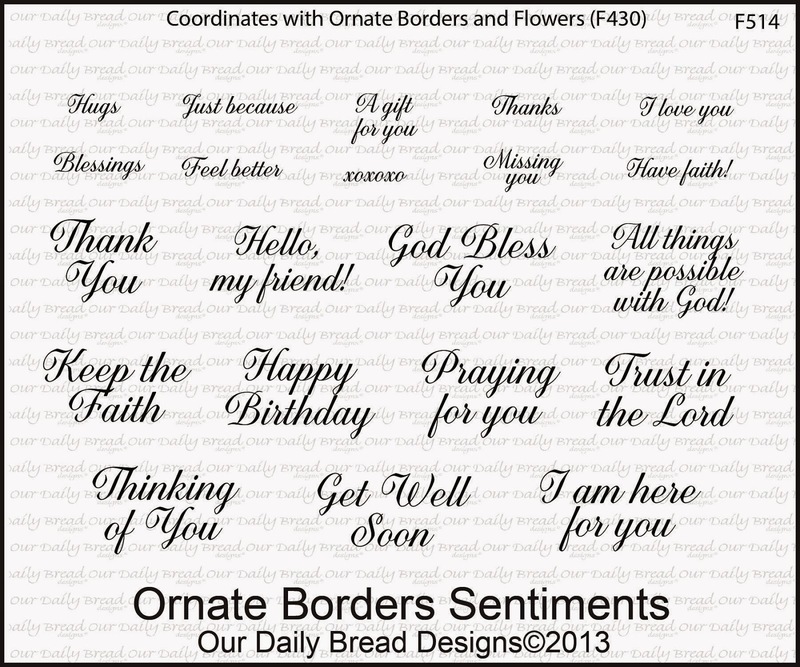 The sentiment was white embossed on vellum, punched with a circle punch and framed with Daffodil Delight card stock. Some dyed ribbon was added to finish the card. 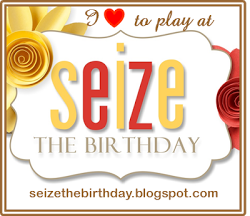 Thanks so much for stopping by…enjoy the day and live it well! Welcome, my friends! 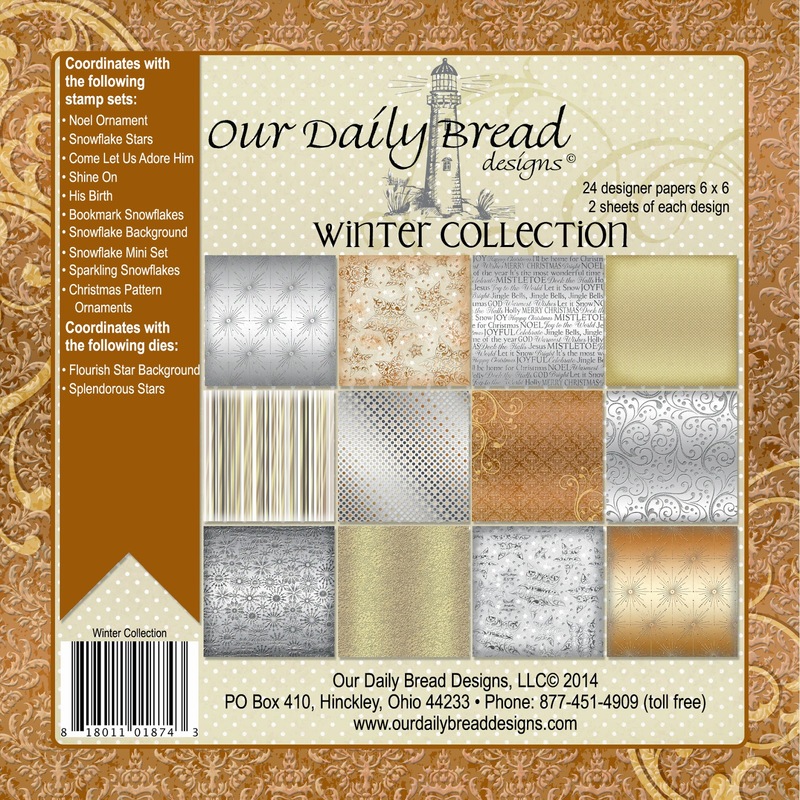 Today we are taking a look back at Our Daily Bread Designs February 2015 Release. 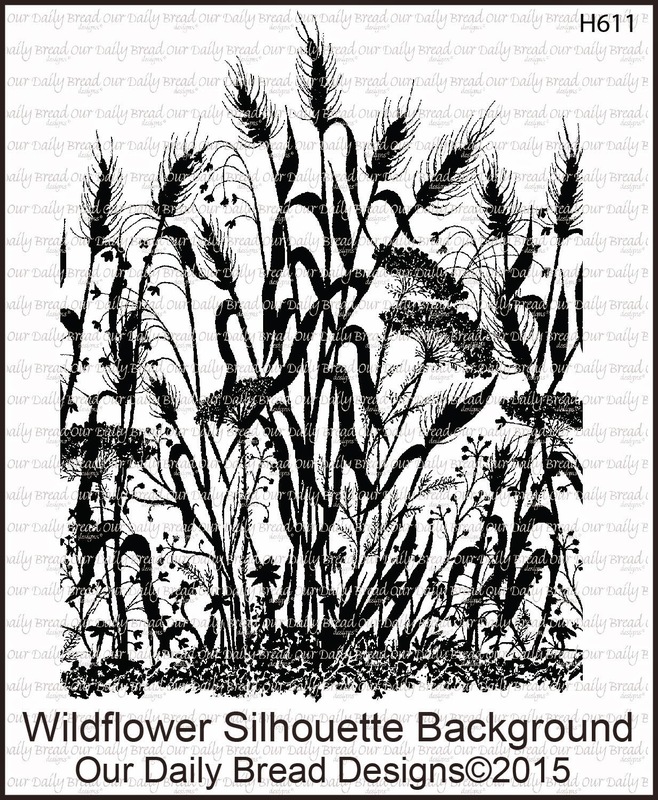 Get ready to view some gorgeous wildflower scenes made with the stamps and word dies released this month. Creative Nugget: I've had this container of mixed gold leaf flakes in my craft drawer for ages and since I've been seeing a lot of cards lately with foiled papers decided to give them a try for my card. 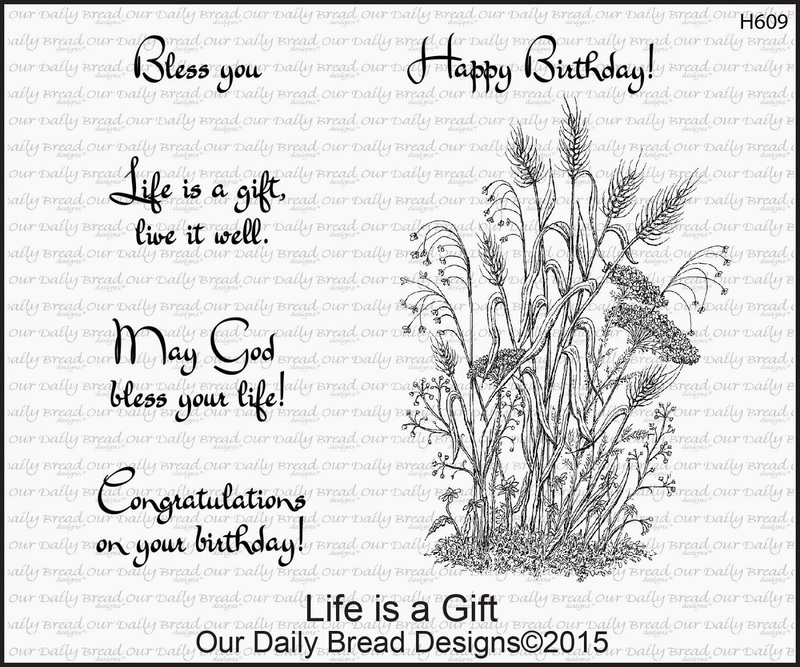 The Life is a Gift wildflower image was inked with VersaMark ink and embossed with Heat 'n Stick Powder. 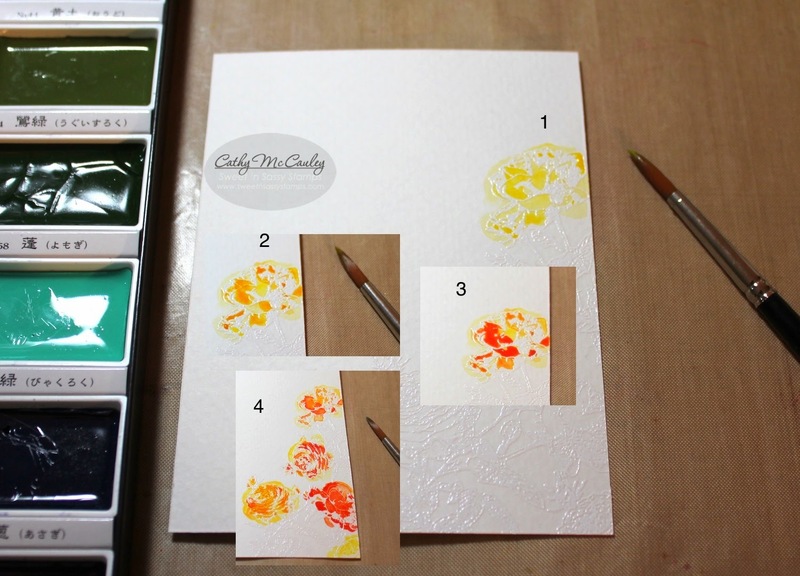 The gold leaf flakes were pressed onto the sticky image and burnished with a bone folder on the back of the card. A stiff brush was used to brush off the extra foil leaving a colorful foiled image. 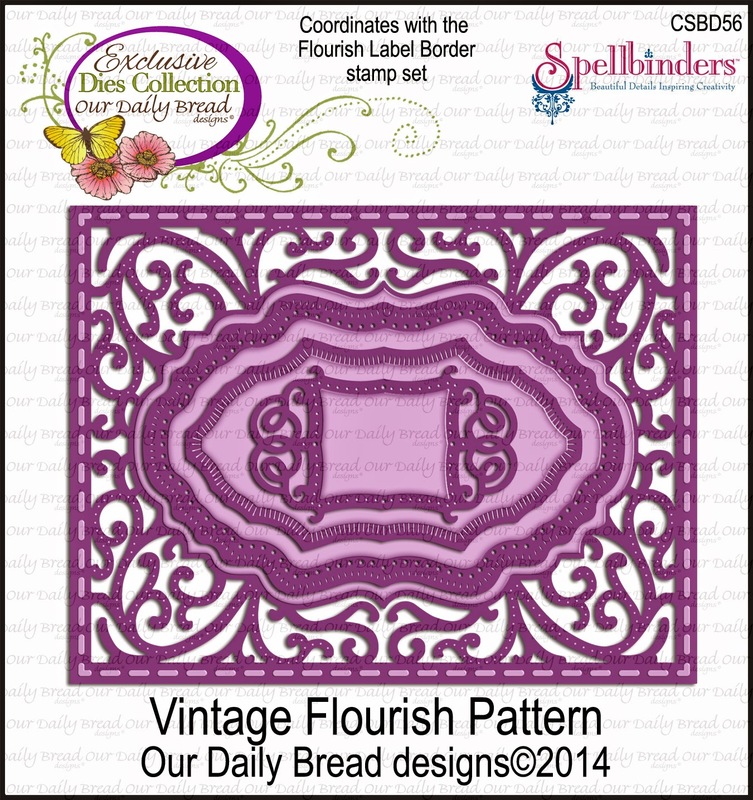 The frame was made with the Vintage Flourished Pattern Die and the Vintage Labels Die. 1/8" Scor-Tape was put around the outside edge of the frame and more gold leaf flakes were applied. The same was done around the edge of the Pennant die cut after stamping the sentiment also from the Life is a Gift stamp set. The heart charm made with the Mini Tags Die was also foiled. Paper from the Winter Collection 2014 was used on the card base and metallic threads were used to make a bow to finish the card. Creative Nugget: Strips of colorful DP and Smokey Shadow card stock were glued on an angle to a piece of copy weight paper which was then cut on an angle. The birthday word die had to be cut in two steps since the layers were too thick so the bottom part of the die was cut from the strips first, then the top part was cut from the Neenah Solar Crest paper, saving the little pieces so they could be glued back into place after the card was put together. 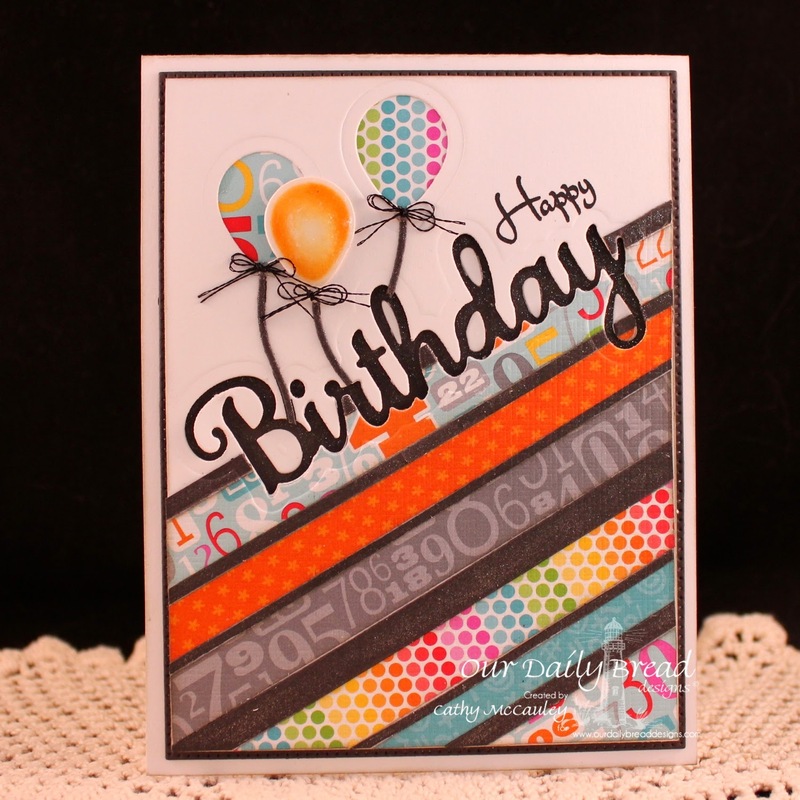 The balloon die was also used to cut two balloons from the same white card stock as the top part of the birthday die. DP was glued under the negative space before attaching everything to a Smokey Shadow mat. 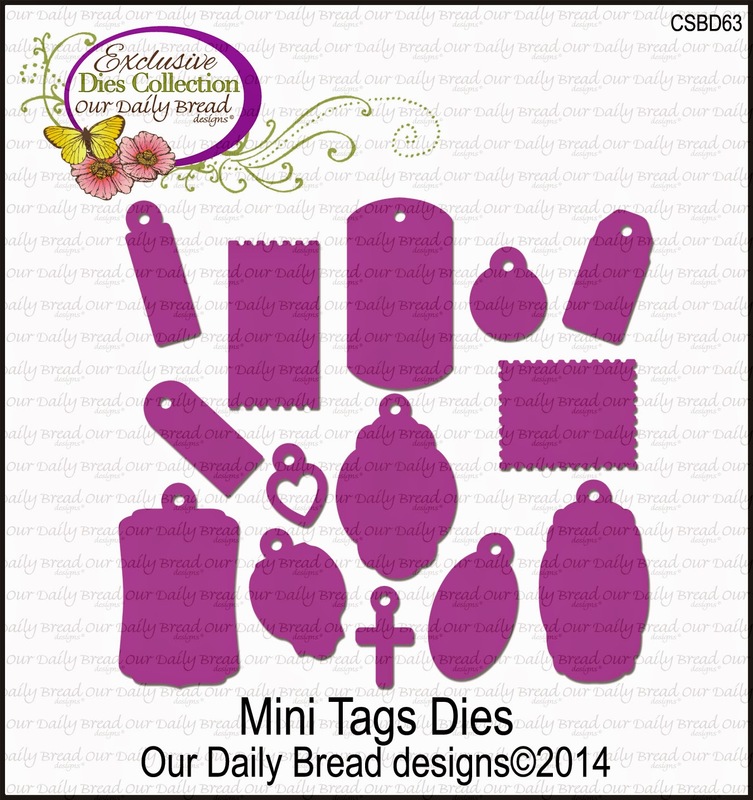 One of the balloon die cuts was sponged and popped up on top, the strings cut, and the little metallic bows attached. 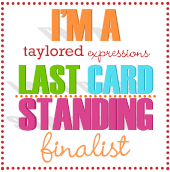 The little "Happy" sentiment is from the Life is a Gift stamp set. 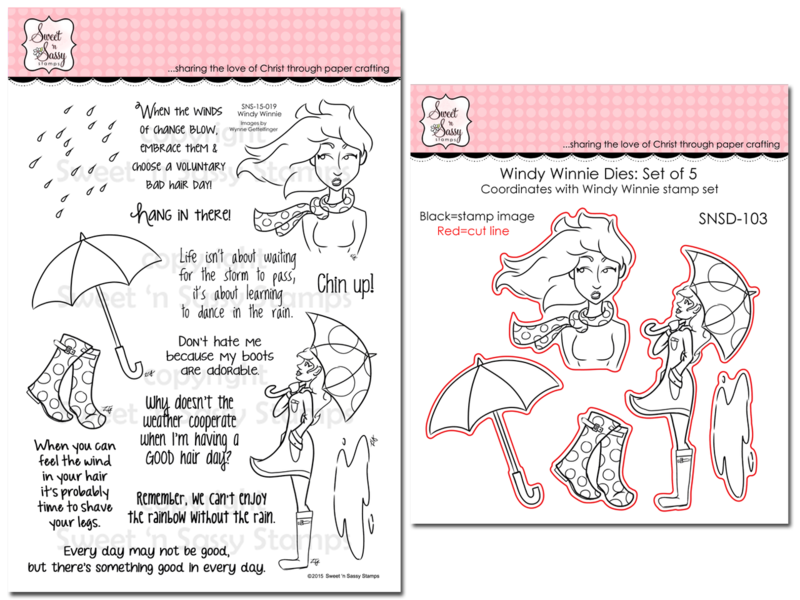 A clear Wink of Stella pen was used on the Smokey Shadow strips to add a little sparkle to the card. 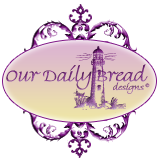 To see more wonderful projects using the new release products, check out the Our Daily Bread Designs Blog. Click the links below to see the details for each project. Hello friends! 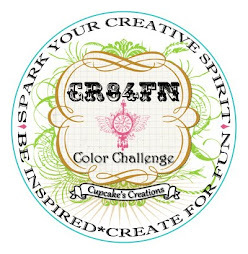 I'm hosting the Ways to Use It Challenge on Splitcoaststampers today where I'm challenging everyone to use buttons and lace, faux or real, on card creations for today's gallery. 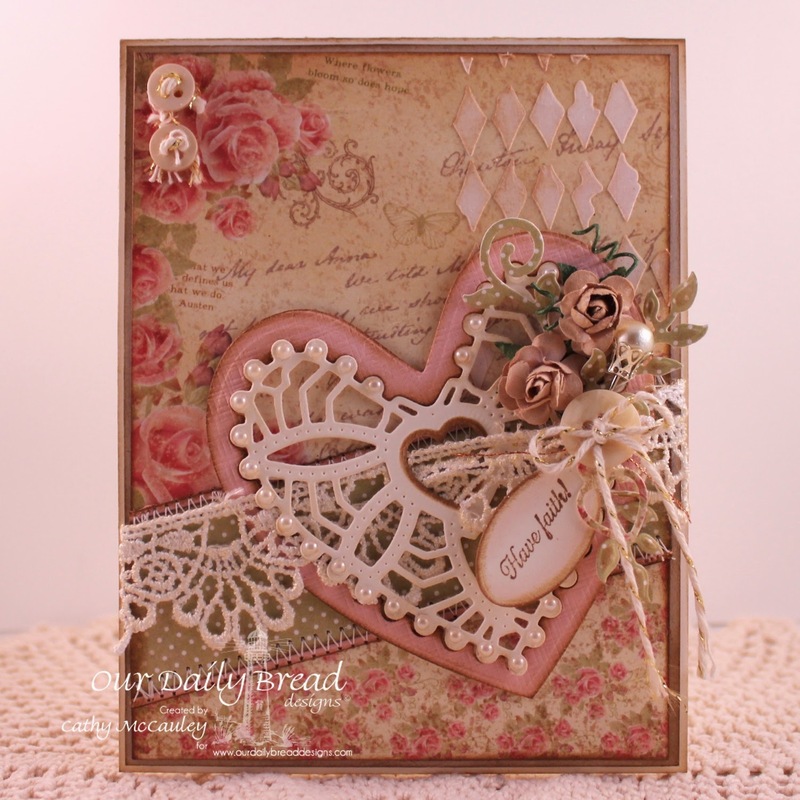 My sample uses both real lace and buttons along with pearls and a little texture for a vintage style card. 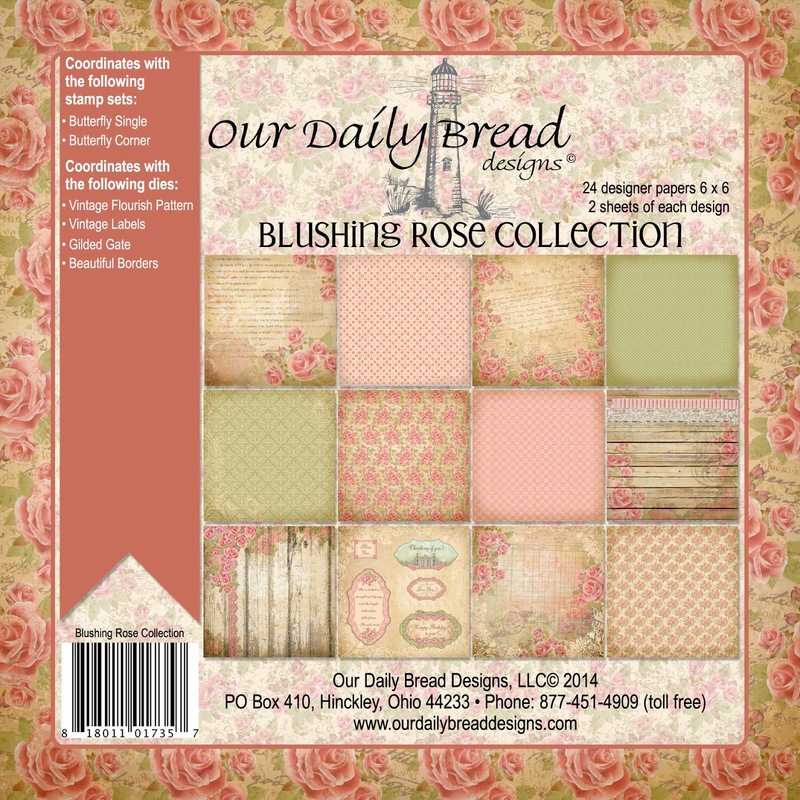 Creative Nugget: I used the Freshly Made Sketch 174 for the design of my card and used the beautiful Blushing Rose Paper Collection by Our Daily Bread Designs to piece together the card front which was inspired by the Our Daily Bread Designs Shining the Light Inspiration Photo. 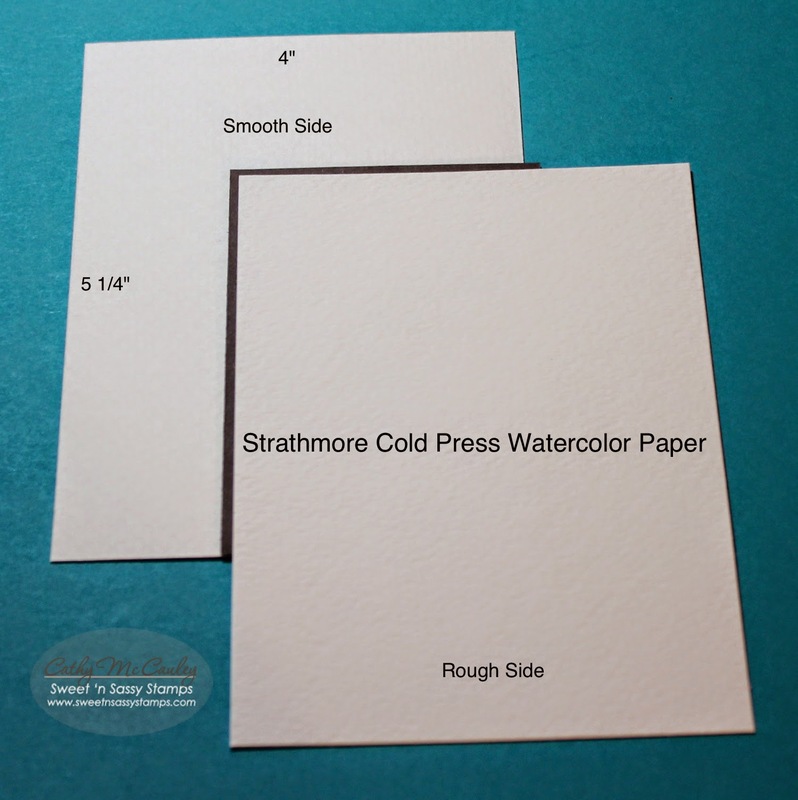 The designer papers were stitched to Kraft card stock and mounted to a Vintage Cream card base. A little texture paste was added to the upper right corner. 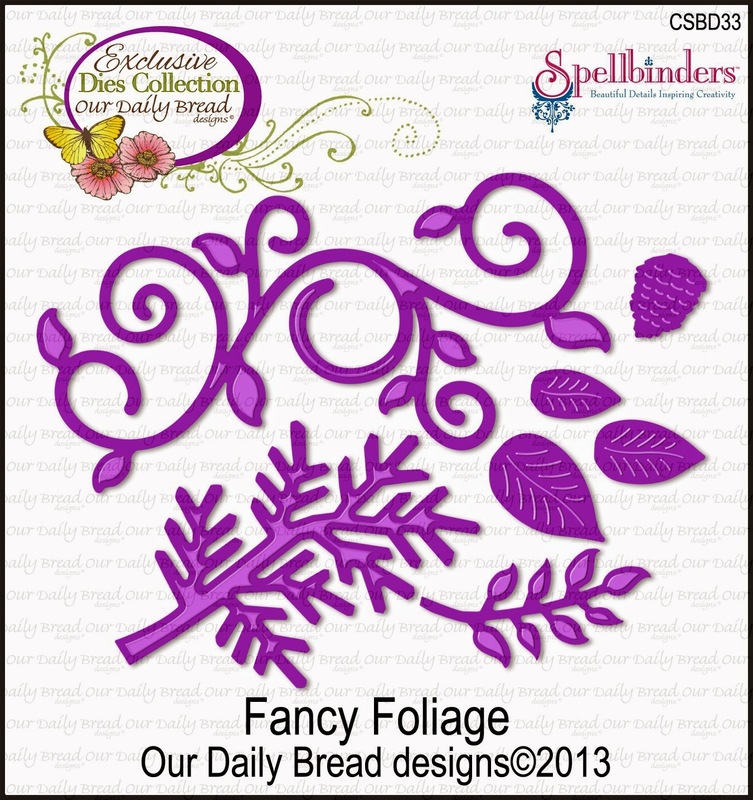 A piece of lace was woven through the Ornate Hearts die cuts also by ODBD. 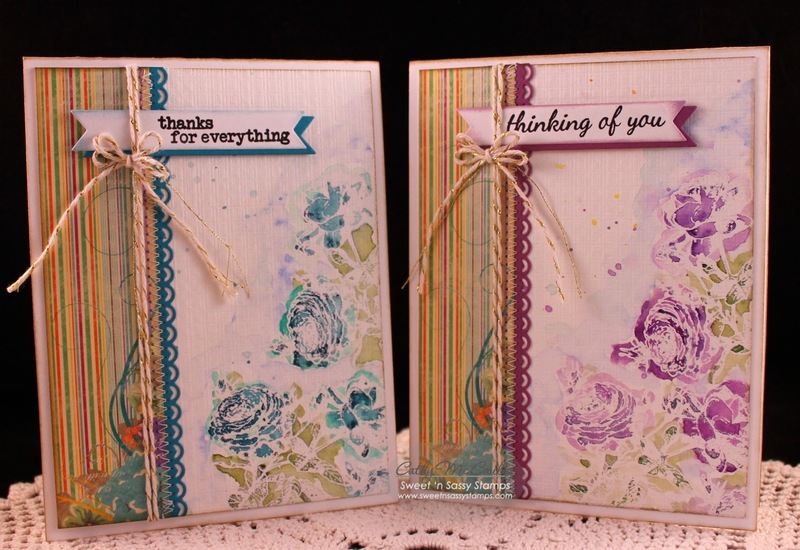 The sentiment from the Ornate Border Sentiments stamp set was stamped on a Mini Tags die cut in Gathered Twigs Distress Ink. 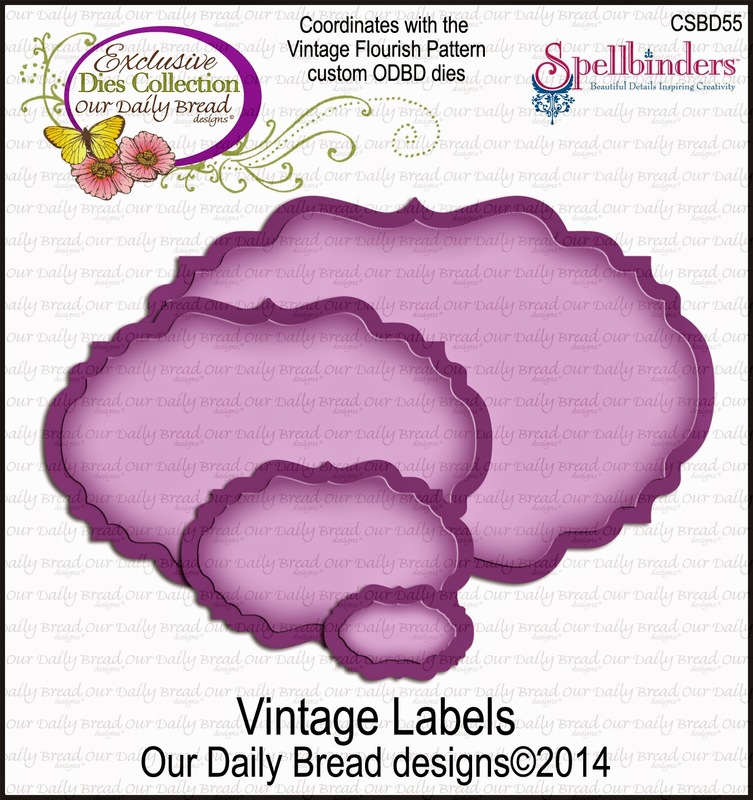 Fancy Foliage die cuts, mulberry flowers, pearls, and buttons add to the vintage look of the card. 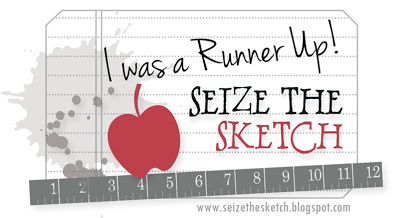 Creative Nugget: KaiserCraft patterned paper, Baja Breeze, and Poppy Red card stock form the layers for the sketch with a Poppy Red Scalloped Border stitched down the middle. Mmmmmmm…hot chocolate looks pretty good right now, don't you think! 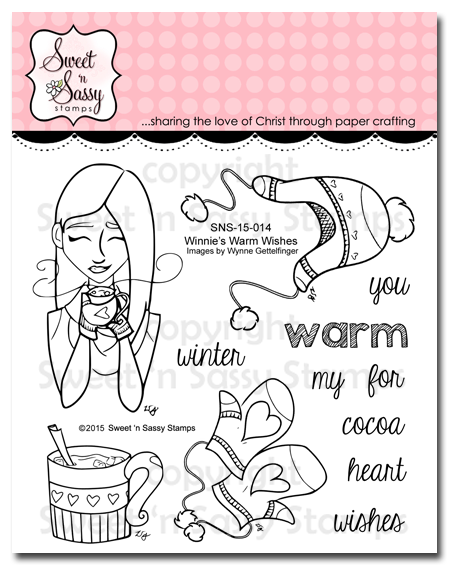 This darling cup of cocoa is from the new Winnie's Warm Wishes stamp set released this month by Sweet 'n Sassy Stamps. It's colored with Copic Markers to match the DP. 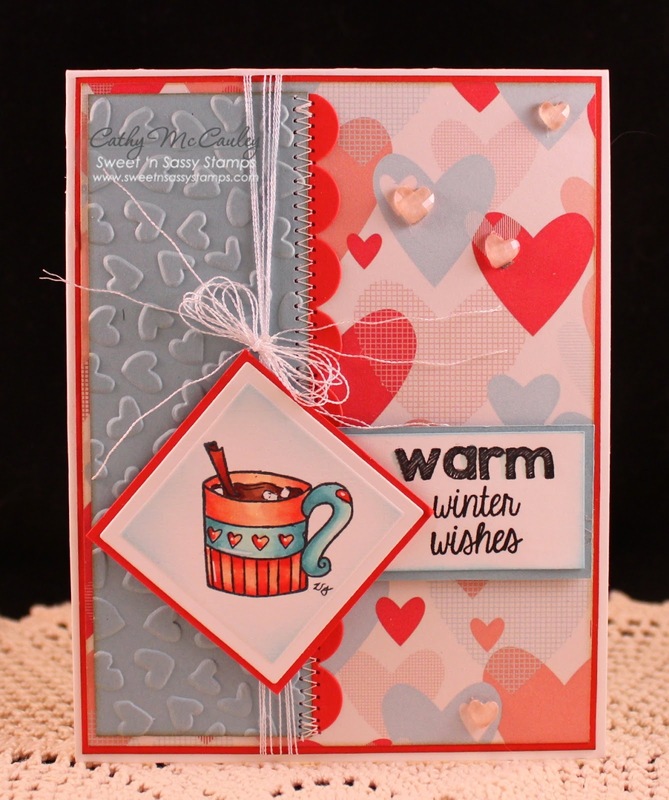 Some metallic thread and heart crystals were added to finish the card. Inspirational Nugget: Our golden, Kody, has absolutely no fear of my hubby and I. We can be reading in bed or sitting on the couch and up he jumps and plops his head right on our laps. Yes…he is a bit spoiled and we do allow him on only these two pieces of furniture. He comes to us boldly and confidently, knowing that he has nothing to fear from us. 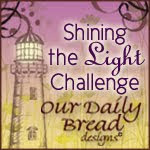 I was thinking of this while reading during my devotion time the other day. "Let us then fearlessly and confidently and boldly draw near to the throne of grace (the throne of God's unmerited favor to us sinners), that we may receive mercy [for our failures] and find grace to help in good time for every need [appropriate help and well-timed help, coming just when we need it]." Love this verse in the Amplified Bible. How wonderful to know that no matter where we are in our walk with the Lord, we can come boldly to Him with our needs, and He gives us just what we need at just the right time! Now that's something you can carry with you in your heart for a time when you need it! I hope you've been inspired by your visit…thanks for stopping by! 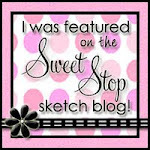 Hello sweet friends…it's Monday and that means it's time for a Design Diva Demo over at the Sweet 'n Sassy Stamps Blog! It's my turn to share so I thought I would share here as well. At the end of this month our church is having a women's retreat. 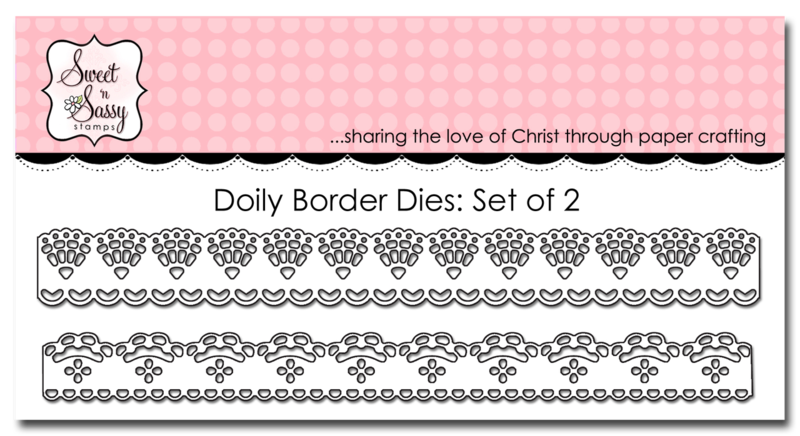 I'll be rooming with two precious ladies from our church, so I decided to make a set of notecards for each of them. 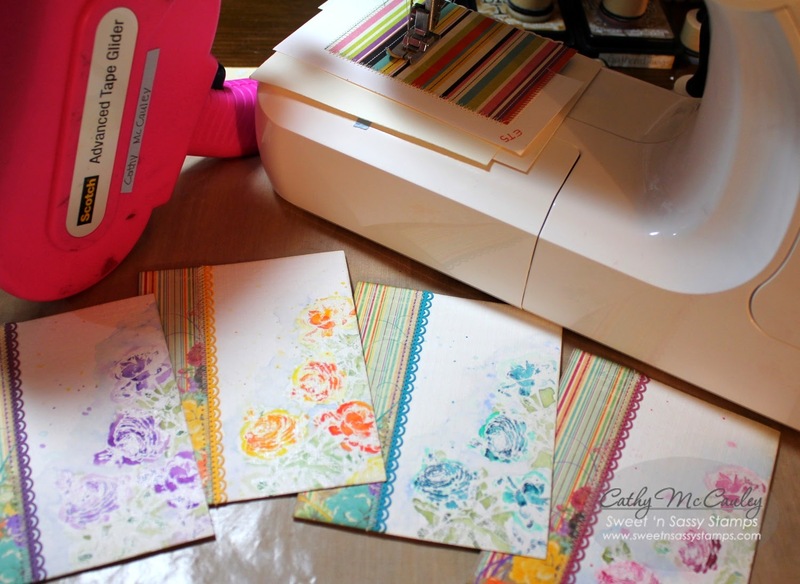 I love trying new techniques and the one I'm going to share with you today is the watercolor resist technique I used to make my set of notecards. Start by gathering the supplies you need to make the notecards. Choose colors and papers that coordinate. 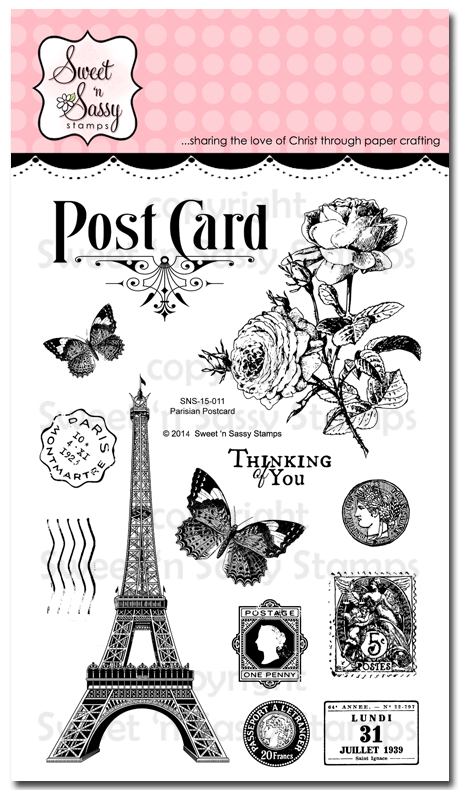 I'm using Bo Bunny papers and the rose image from the new Parisian Postcard stamp set by Sweet 'n Sassy Stamps. 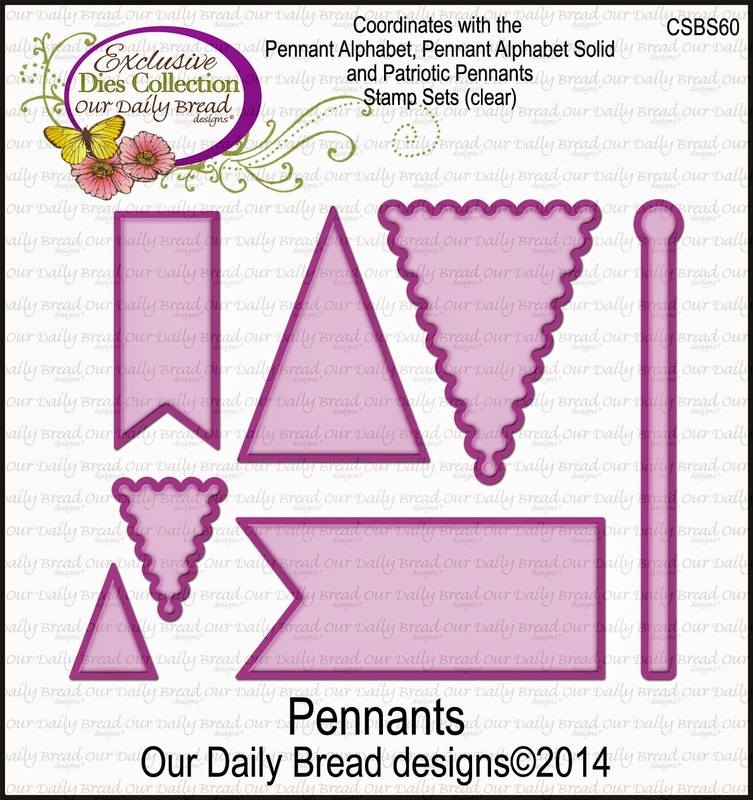 To prepare the card bases cut Neenah Solar Crest card stock to 4 1/4" x 11" and score at 5 1/2". Cut watercolor paper into panels measuring 4" x 5 1/4". I used Strathmore Cold Press Watercolor Paper for my project which has a smooth side and a textured side, but any watercolor paper or mixed media paper would work for this technique. Stamp the rose from the Parisian Postcard stamp set on the smooth side of the watercolor paper with VersaMark ink and emboss with white embossing powder. You could also use clear powder if you don't have white. 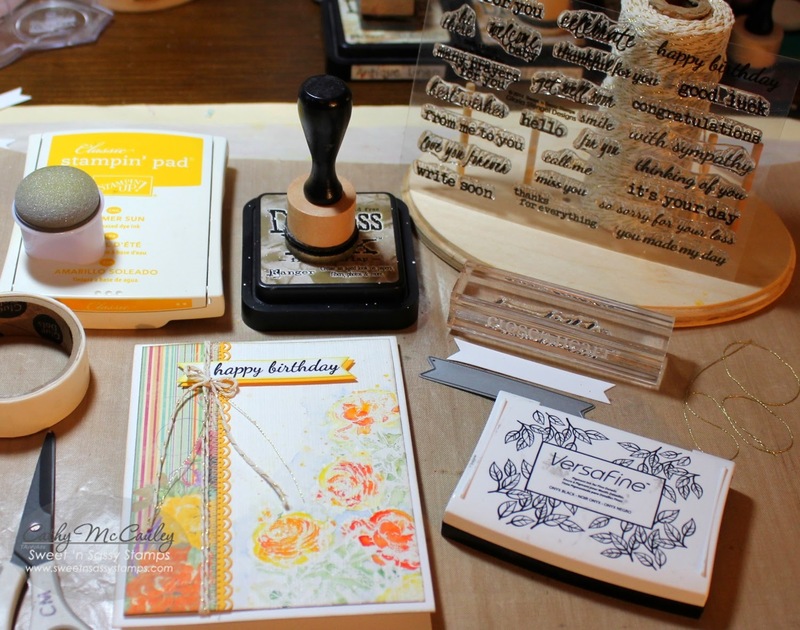 I plan where I want the stamping to go on a scrap piece of paper and use a stamp positioner to make sure the image is in the same place on all four cards. 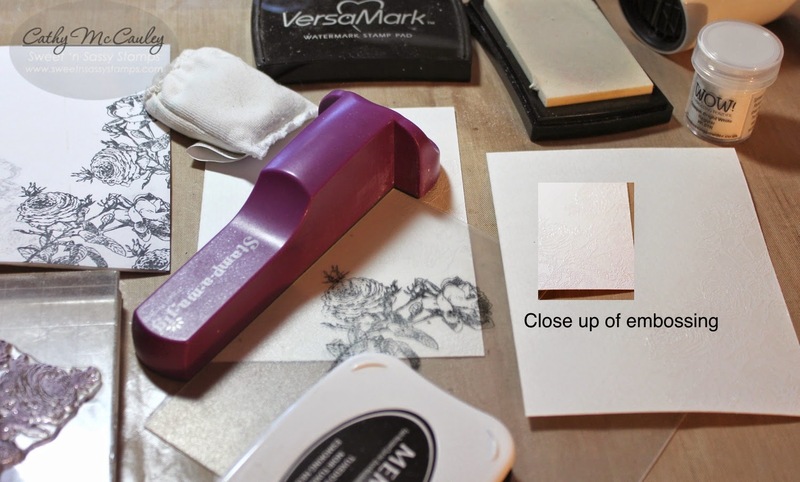 Rub an embossing buddy over the watercolor paper before stamping to make sure the embossing powder sticks only where you want it to stick. Click on any of the pictures to see a close up of the details. Since these watercolors are new to me, I wanted to test the colors on scrap pieces of watercolor paper to make sure they would match my papers. Now comes the fun part. Use plain water to wet the areas where you want the color to be and drop the color you are using onto the wet area using a paint brush. The water and the paint do all the work. 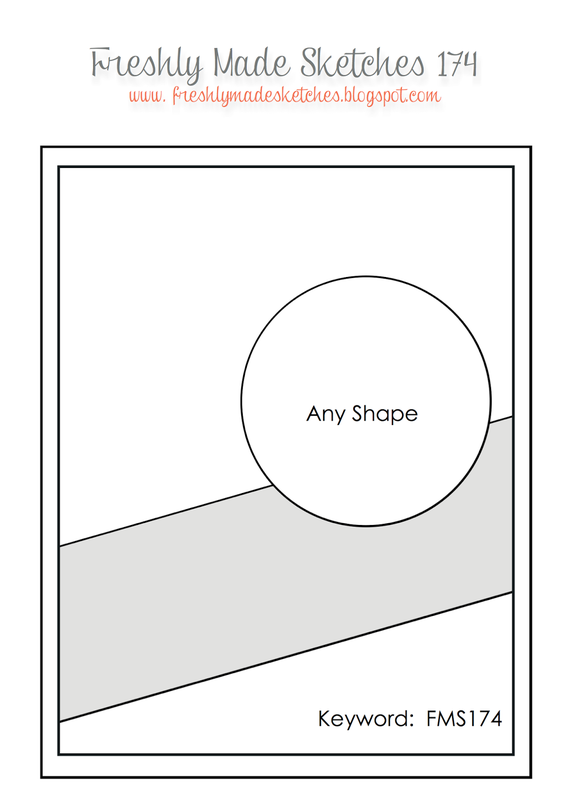 Start with the lightest color and keep adding darker layers for shading. 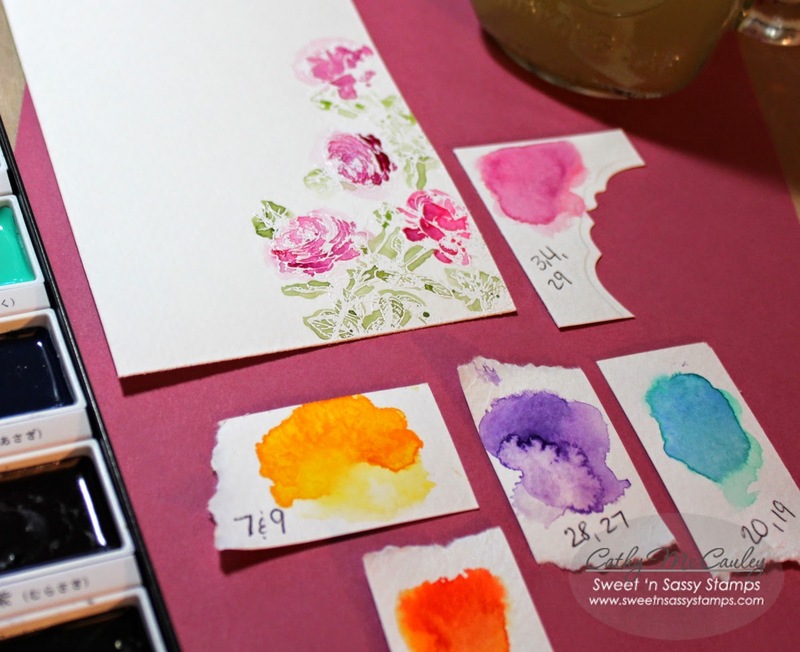 I am using a set of Kuretake Gansai Tambi watercolors, but you can use any watercolor set, distress inks, or stamp pad refills to do this step. The embossing will resist the watercolor. Don't be afraid to go outside the lines for a softer look. Wait until each area is dry before moving onto the next part. The flowers were dry before moving onto the leaves, and the background and splatters were added last. Too much water can be dabbed off with a paper towel. 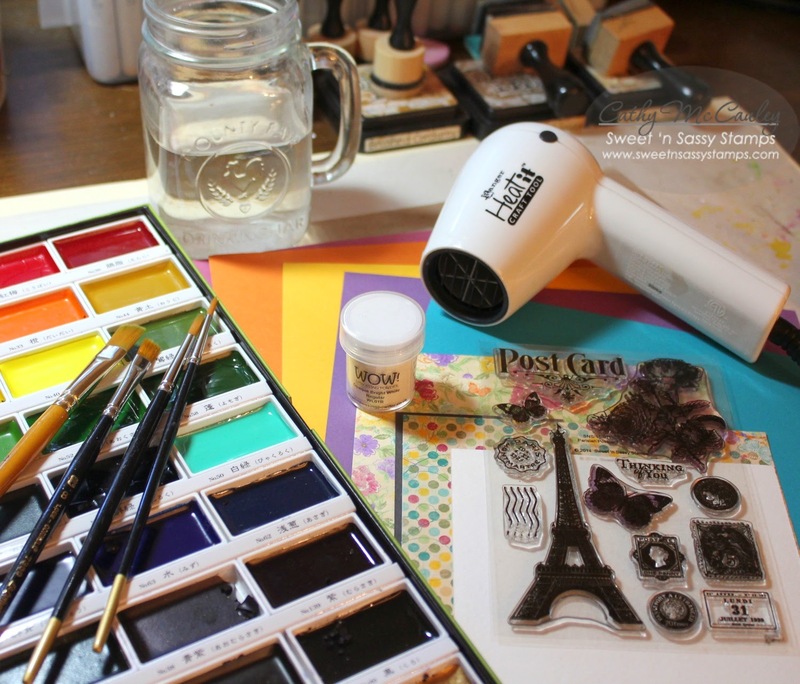 Remember…watercolors will dry lighter than they look while wet. Each of my cards will be a different color. 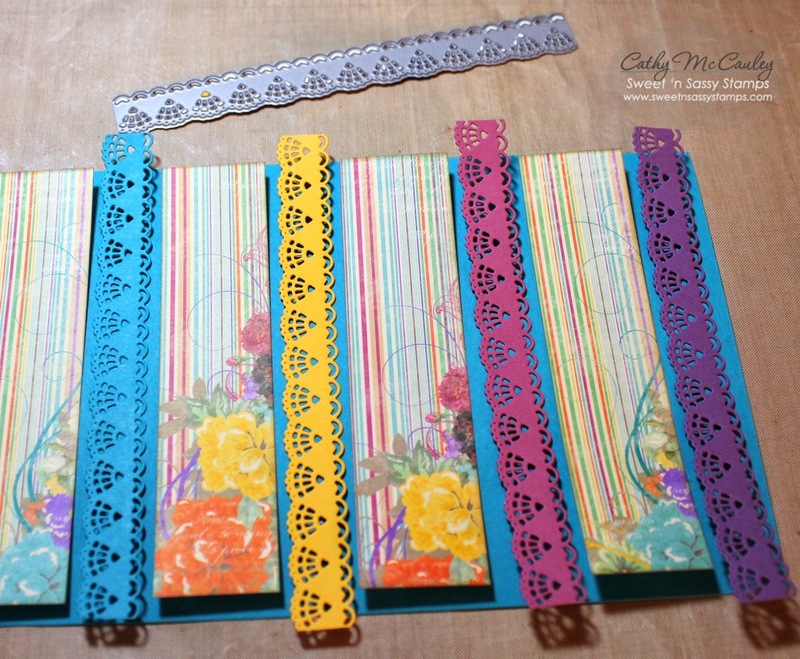 Attach the Doily Border to the DP strip and mount this to the left side of the watercolored panels. I decided to stitch mine on since I love to sew on cards. Now it's time for the finishing touches. Sponge your edges. 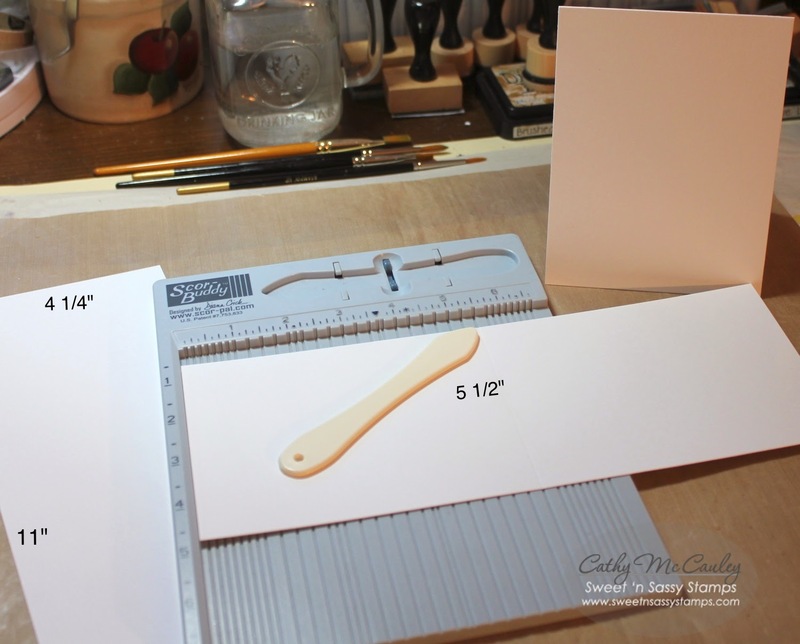 Wrap some twine twice around the watercolor panel before attaching it to your card base. 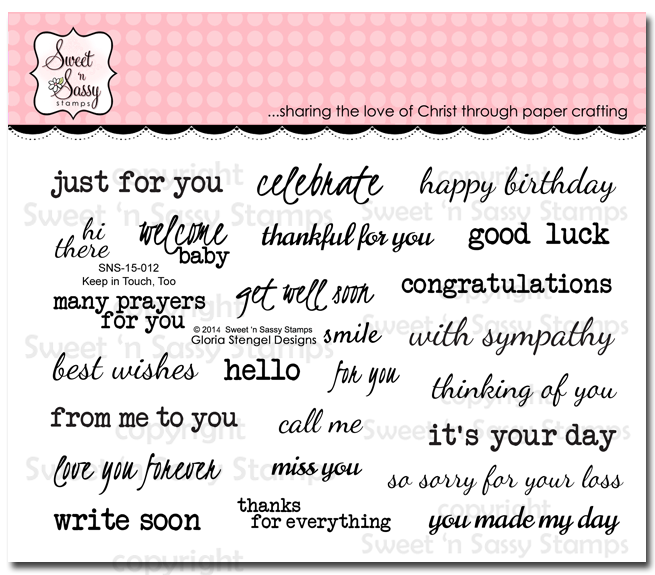 The sentiments I used came from the fabulous Keep in Touch, Too stamp set which has tons of greetings perfect for any occasion. 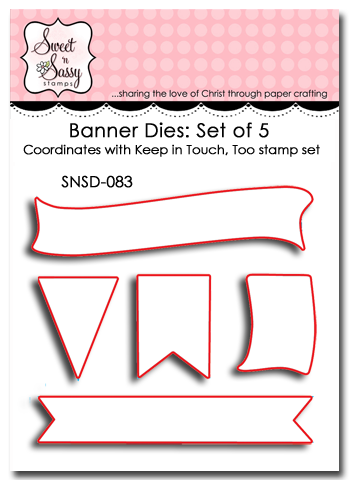 The really cool thing about this sentiment set is that all the sentiments fit on one of the new Banner Dies! 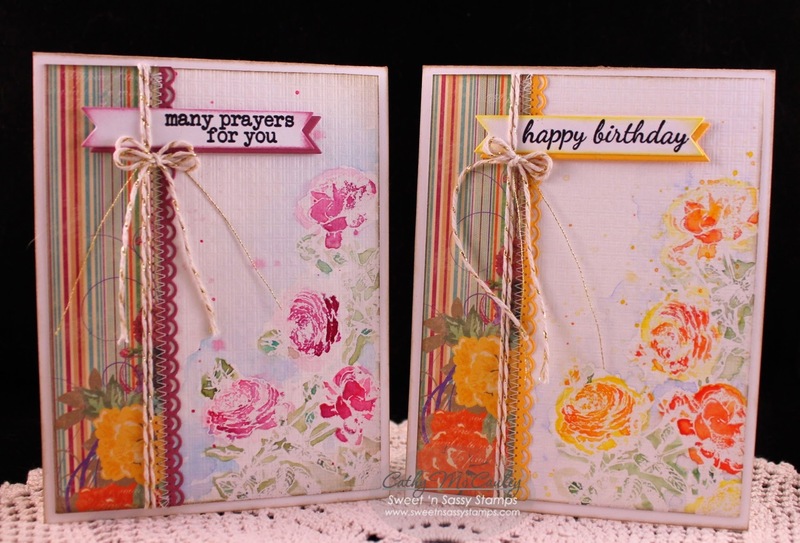 Add a little twine bow and the cards are finished! Wrap the finished cards in ribbon or package them however you want to give as a gift. I made a little card purse to put mine in, but that is another tutorial for another time! LOL! Thanks so much for stopping by…have a marvelous Monday! Hello friends! 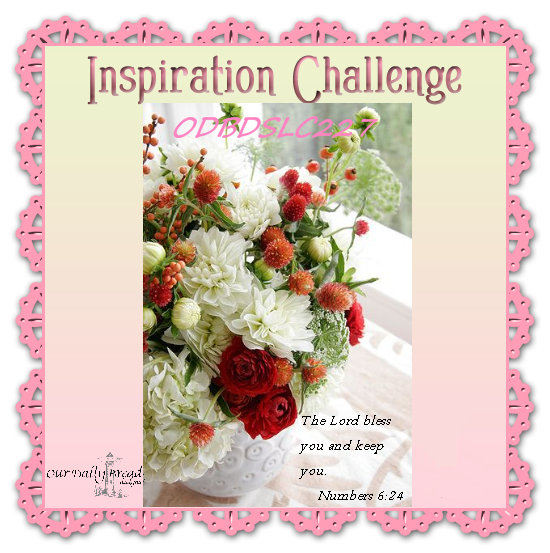 I have another quick challenge card for you today. 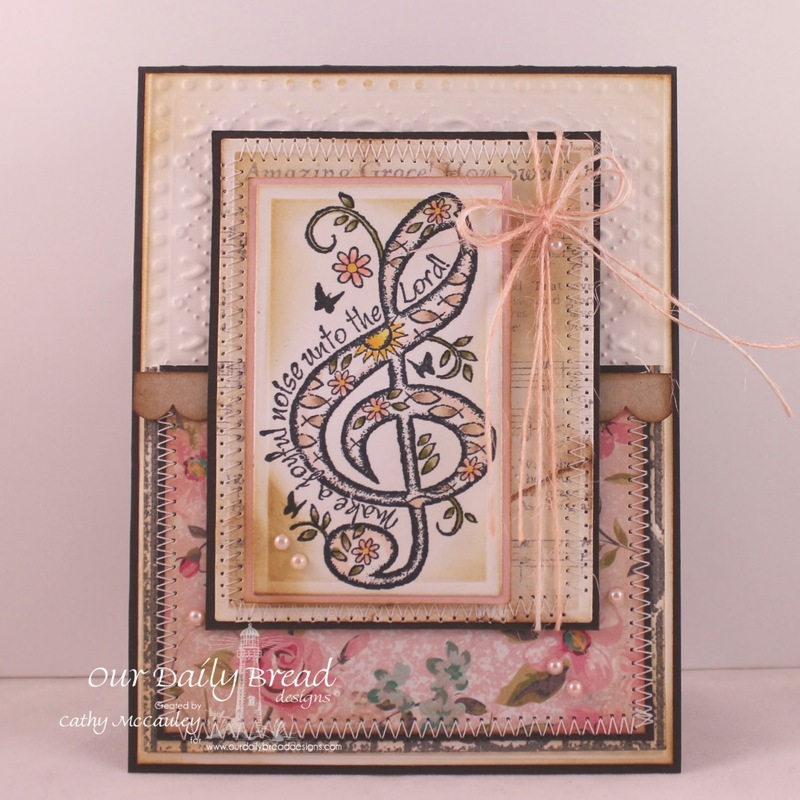 The musical theme of the card came from the Splitcoaststampers' Ways to Use It Challenge for today. 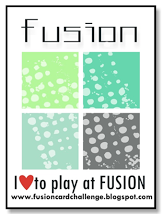 Creative Nugget: I took this card apart several times before ending up with this…ever do that? 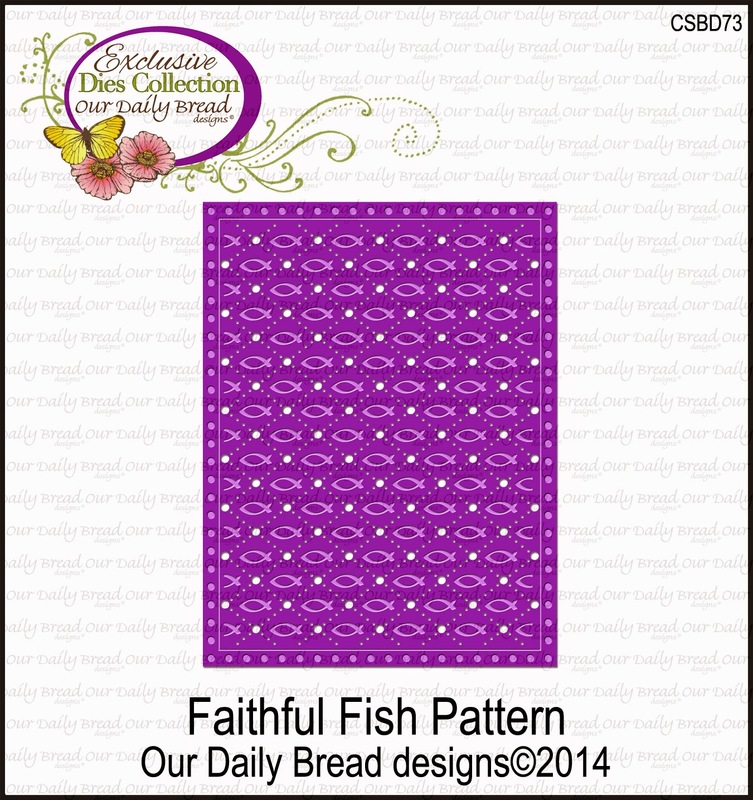 The Faithful Fish Pattern Die was used to emboss the top of the background layer. The bottom is KaiserCraft designer paper. 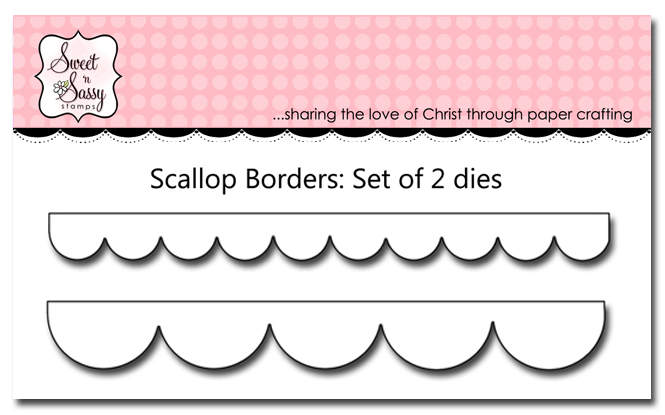 A Punched scallop border separates the two sections. 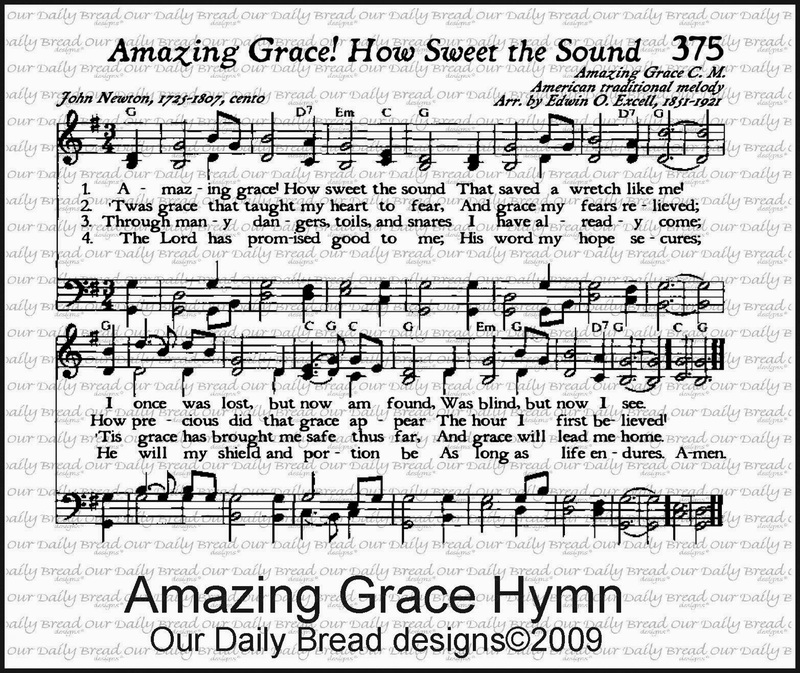 Amazing Grace was stamped in Watering Can Archival Ink and cut with a Rectangle Nestie for the second layer. 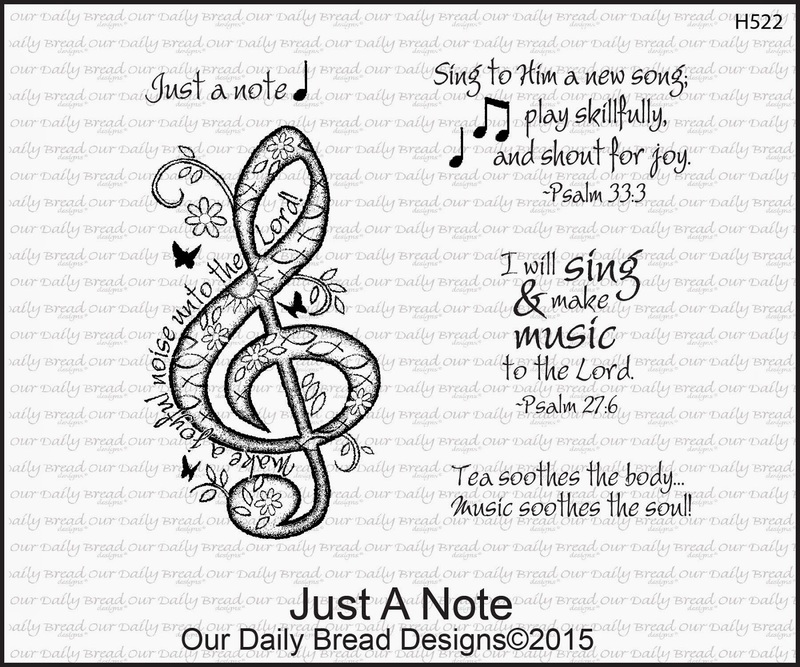 Finally the treble clef from the beautiful Just a Note stamp set by Our Daily Bread Designs was stamped, colored with Copic Markers, and cut with a Matting Basics Die from Spellbinders. All of the layers were matted and stitched to Smokey Shadow or Blushing Bride. 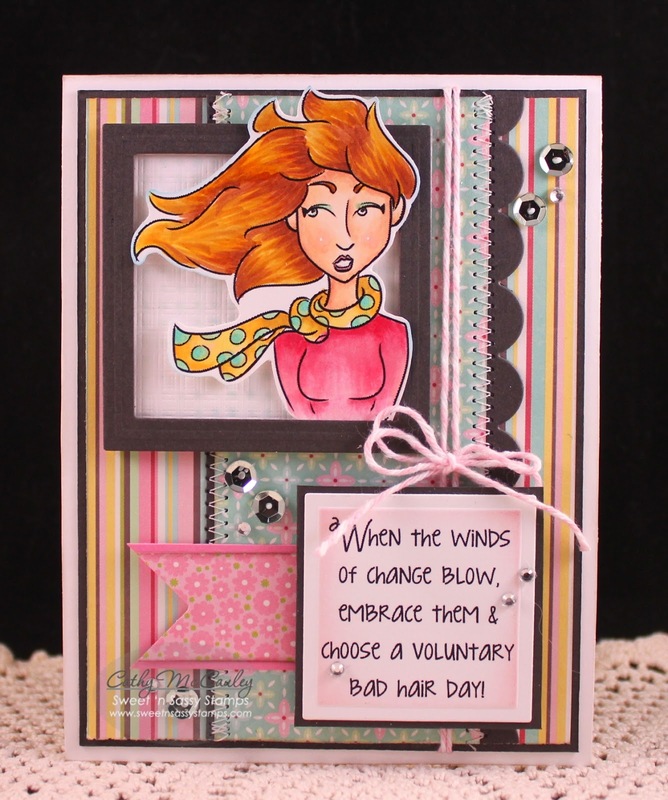 Jute was colored with a Copic Marker to match, a bow made, and pearls added to finish the card. The MOJO Monday sketch was used for the design of my card. 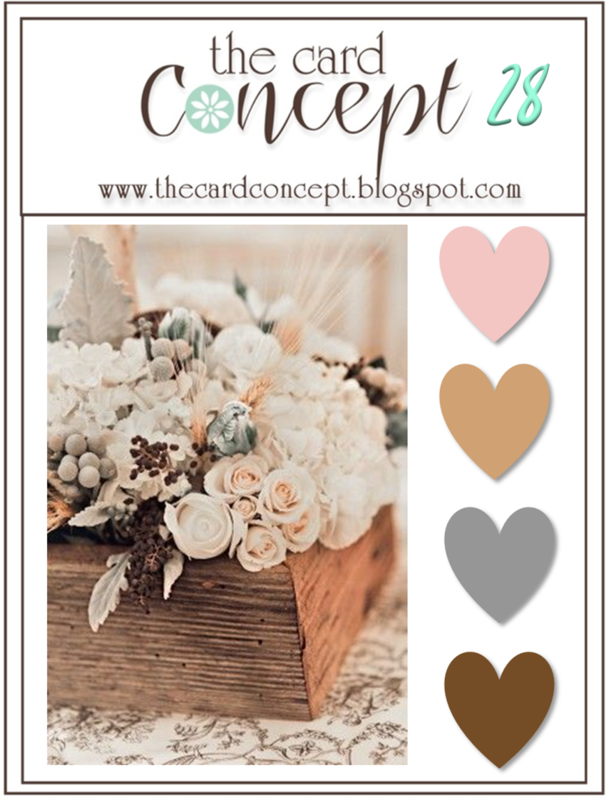 The shabby, vintage colors came from The Card Concept. As always…I appreciate your visit! 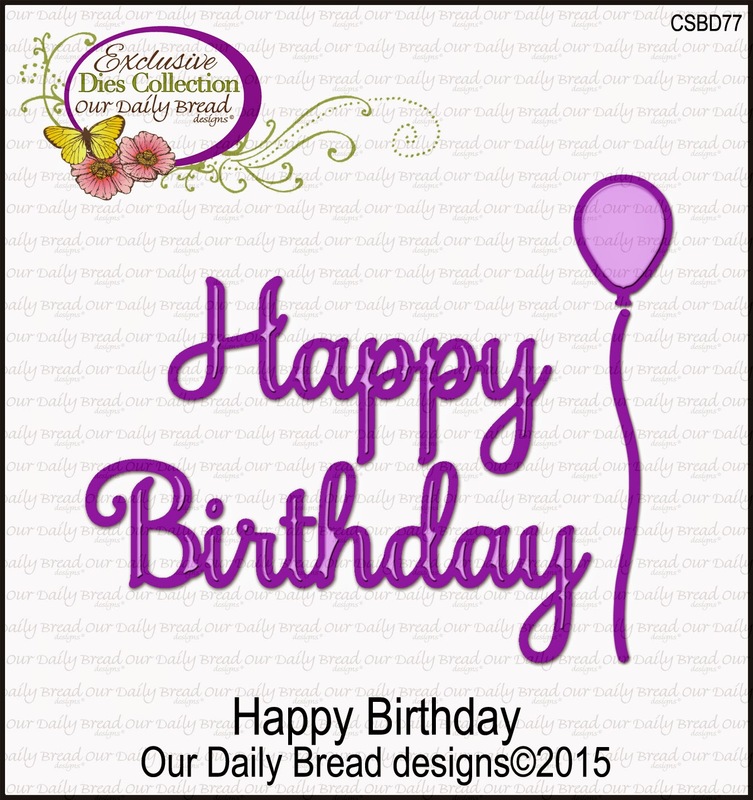 Thanks so much for stopping by…have a wonderful day!